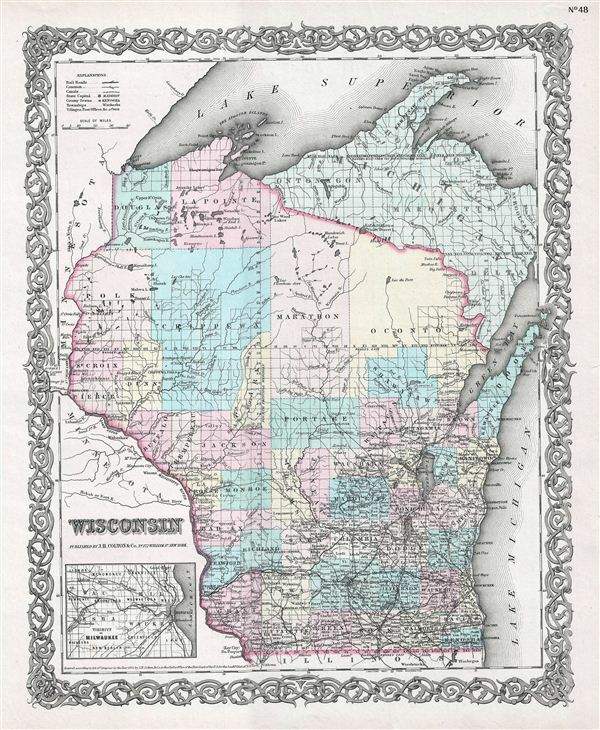 An excellent 1855 first edition example of Colton's map of Wisconsin. Like most of Colton's state maps, this map was derived from an earlier wall map of North America produced by Colton and D. Griffing Johnson. Covers the entire state bounded on the north by Lake Superior, on the east by Lake Michigan, and on the west by Minnesota Territory. An inset of the vicinity of Milwaukee appears on the bottom left corner of the map. The map also delineates survey grids and plats referencing the work of the U.S. Land Survey. Several American Indian reservations, including the Oneida Reservation, are noted. This map also identifies various forts, rivers, fords, and an assortment of additional topographical details. Map is hand colored in pink, green, yellow and blue pastels to define state and territorial boundaries. Surrounded by Colton's typical spiral motif border. Dated and copyrighted to J. H. Colton, 1855. Published from Colton's 172 William Street Office in New York City. Issued as page no. 48 in volume 1 of Colton's 1856 Atlas of the World. Rumsey 0149.053 (1856 edition). Phillips (Atlases) 816.